INDIANAPOLIS — Kyler Murray speaks low, his voice monotone. This is on the third day of the 2019 NFL scouting combine, and as Murray is sitting down for one more interview in the middle of a long day chocked full of them, the monotony of it all is evident as Murray greets more questions about his height, hand size and bulk with similar answers to the ones he has been giving all week. A question about whether it’s by design that the 5-foot-10, 207-pounder never seems to get hit, despite his lack of bulk, causes him to perk up. His eyes widen slightly, his voice gets a bit louder and finally, it seems, the 2018 Heisman Trophy winner has been asked something new. “You’re definitely right — you’ve been paying attention,” Murray told Yahoo Sports in a sit-down interview. “I think that’s just ... nobody wants to get hit, obviously. When I’m delivering the ball, if I’ve got to take the hit, I’ve got to take the hit. Murray’s elusiveness, both before and after he delivers the ball, is an underrated trait, one that could help him go No. 1 overall to Arizona in the 2019 NFL draft. Professional football has never been so pass-happy or wide open, and Murray’s dazzling dual-threat ability is tailor-made for The New NFL, where points are aplenty and quarterbacks of all shapes and sizes are welcome. With his sizzling arm and strong understanding of strategy and fundamentals — all of which were instilled by his father Kevin, a former starting quarterback at Texas A&M — the only thing critics have ever been able to knock him on is his diminutive size, which has traditionally terrified NFL decision-makers due to the degree of punishment NFL quarterbacks take. But to hurt a quarterback, defenders have to hit him first. And college defenders admit they had a difficult time doing just that. Omenihu has the distinction of sacking Murray twice, something many defenders can’t brag about. There are a few reasons for that. For one, Murray operated primarily out of the shotgun in coach Lincoln Riley’s Air Raid offense at Oklahoma, which is predicated on quick reads and getting the ball out fast. There’s also the fact Murray played behind a strong offensive line that surrendered only 19 sacks this past season — which ranked 23rd in the country — and featured four players who were invited to this year’s combine. But the biggest reason for Murray’s general lack of wear-and-tear is the simple fact the 21-year-old is a bona fide expert at protecting himself on the field. And it goes beyond the smart way he’ll sometimes go down on his own to avoid unnecessary hits when he’s corralled in the pocket with zero chance of escape. 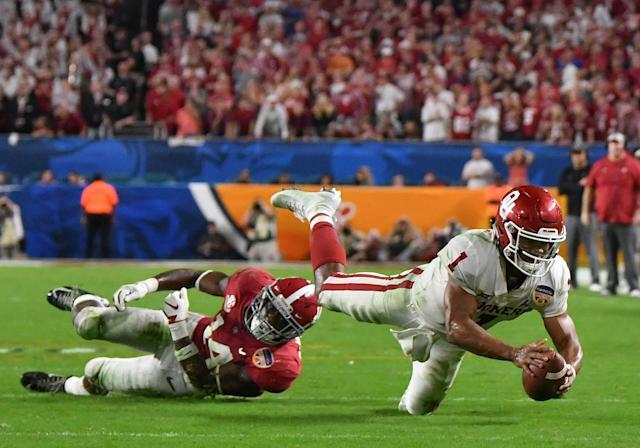 Kyler Murray vs. Alabama in the Orange Bowl. And sometimes, he’ll end a play with an easy, perfectly timed feet-first slide, which isn’t a surprise considering his baseball background. 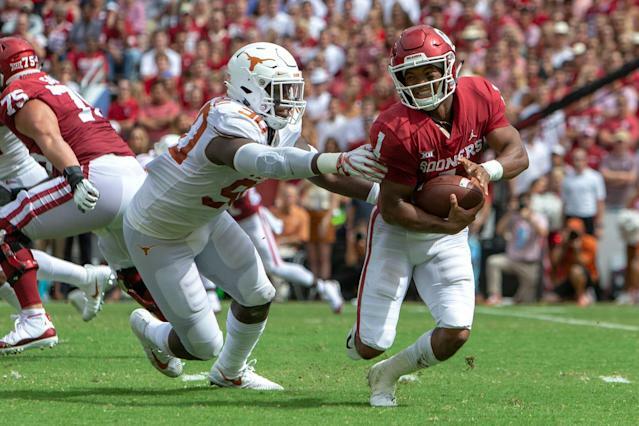 Kyler Murray scrambles and slides against Texas. “As soon as he throws it, he has a feel of where somebody’s coming from and he’ll hit them with, like, a Eurostep, I guess you can say,” said Cody Ford, Murray’s right tackle at Oklahoma. Murray’s favorite trick is shuffling left, right or backward shortly after he delivers the football in an effort to put further distance between himself and a defender. This little trick not only makes it harder for defenders to strike him, he also puts himself in a clear line to be seen by an official and potentially draw a penalty in the NFL, which is determined to protect its quarterbacks at all costs. And when you combine this reality with a lack of bulk that should make even middling hits look colossal, it’s easy for a defender’s zeal to strike get tempered by the ever-looming threat of a flag. For all these reasons, those who have practiced and played against Murray believe he’ll hold up fine physically in the NFL. Mack trailed off, but his point was clear. If NFL defenders can’t regularly punish the stationary Brady, how are they supposed to regularly hit a target 6 inches shorter with speed like Michael Vick and moves like Barry Sanders? To that notion, teammates just shrug. Even when Murray is hit, he often pops right back up, flashing a competitive toughness that inspires them. Such was the case in the Sooners’ 48-45 loss to the Longhorns in October, when Murray — who has lost only three times as a starting quarterback dating back to his days as a Texas high school legend from 2012-2014 — nearly guided a 21-point fourth-quarter comeback. We’ll see how much they actually respect Murray when the draft rolls around. But no matter where he is selected — whether it’s to the Cardinals at No. 1 or somewhere in the first round — whichever team selects him will do so because it knows the man who is set to be the NFL’s smallest quarterback is serious about (and capable of) protecting himself.